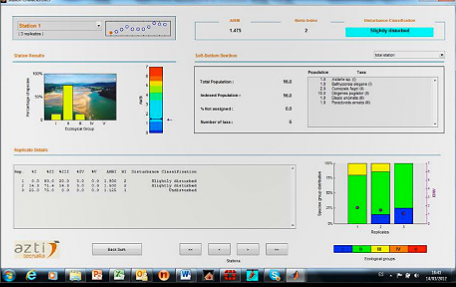 The AZTI Marine Biotic Indix (AMBI) is software developed by AZTI-Tecnalia for assessing the quality of benthic macro-invertebrates assemblages by calculating the homonymous index. It was developed in order to establish the ecological quality of European coasts and estuaries. This tool explores the response of soft-bottom communities to natural and man-induced changes in water quality, integrating long-term environmental conditions. The software includes near 8.000 taxa from all seas, representative of the most important soft-bottom communities present at estuarine and coastal systems, from the North Sea to the Mediterranean, North and South America, Asia, etc. This tool allows you to easily calculate the AMBI, represent your data and export results. You must use the guidelines published in Marine Pollution Bulletin. Version 5.0, from May 2012, allows importing more than 255 samples from an Excel file, with the updated species list from November 2014. The AZTI Marine Biotic Index (AMBI) is developed by AZTI-Tecnalia. Since February 2012, the Steering Committee of the Salmon Aquaculture Dialogue, promoted by WWF (World Wildlife Fund), has included the toll AMBI as one of the indicators to assess the environmental impact of farmed salmon, worldwide. AMBI is a software for WXP, W7 and W8.